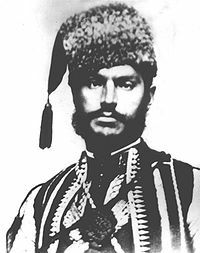 On this date in 1868, the Ottoman Turks executed Bulgarian revolutionary Stefan Karadzha. Karadzha was one of several nationalist cheta (guerrilla) leaders aspiring to father the future sovereign Bulgaria. Operating from adjacent, and conveniently independent, Romania, around 1866-1867, Karadzha and others of his ilk — Hadzhi Dimitur Nikolov, Filip Totyu, and the dramatically mustachioed Panayot Hitov — slipped over the mountainous border to organize revolutionary cells and foment ill-feeling towards the Sublime Porte. In Bulgaria’s late 19th century progress towards independence, these figures are transitional characters between the vanguard leadership of Georgi Rakovski, and the ensuing primacy of Vasil Levski. 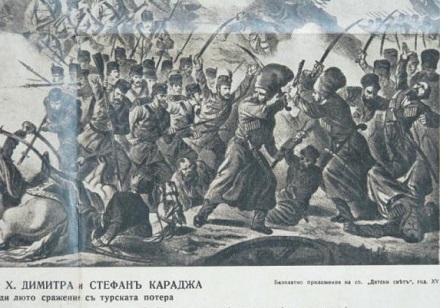 Levski himself was a guerrilla in this period; after the cheta legions suffered some backbreaking defeats in the field — one of which saw our man Karadzha captured so badly wounded that he was “half-dead before the emergency Turkish court”* when condemned to hang — Levski set about honeycombing his country with the revolutionary network that would shape the future revolutionary struggle. A national hero of lesser stature than Levski, which is sure no disgrace, Karadzha has a village named after him. * The quote is from the unimpeachable source of Karadzha’s Wikipedia page.